SMOR II is supplied with two SM01 blades and can also be used with the SM01B, SM02, SM03, SM03B and SM04 blades. Trimming Knives The stylish black Trimming Knife is a heavy-duty fixed-blade knife with a spring-loaded mechanism for easy opening of the handle for blade changing or safe storage. Inside the handle is a nylon holder for spare blades and each handle is supplied with 3 No. SM92 blades. 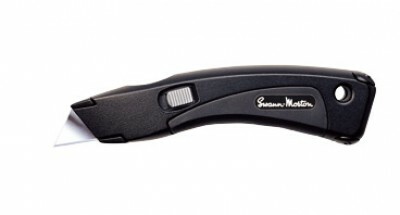 The Trimming Knife is supplied complete with a smart black Holster which clips onto a belt or waistband. A full range of heavy-duty blades is available and they are supplied in boxes of 100.